You can’t miss it as you leave Madison, heading north on I-90. Take exit 131 and you are soon there. This prime location has given them so many customers, they had to expand over the last year to keep up. In the 70’s, the store was mostly a liquor store with some cheese. Tony’s parents owned it from 1988-1998, increasing the amount of cheese over liquor. 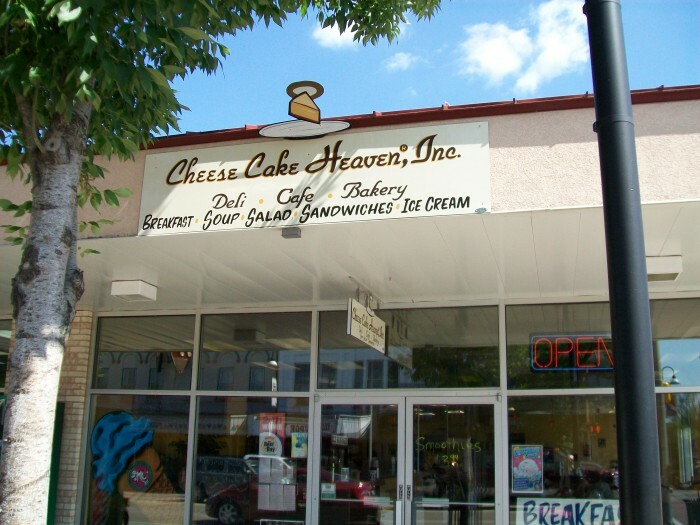 Tony took over ownership of the Mousehouse Cheesehaus in 1998 from his parents and added homemade fudge in 2009. I took this photo in 2010. The mouse on top of the roof is named Igor. Hours are 8 AM-7 PM daily so plenty of time to stop in. In 2016, before the expansion, CEO Tony Sobczak and Vice President Heather Smythe explained all that they do on a local Wisconsin program called, “Talk of the Town”. She has been there for 20 years! The expansion was completed in 2017 and there is room now for much more cheese and fudge! Read more about the expansion here. The inside is just as amazing, bring a cooler because you are going to need it. This is your one-stop shop for all things Wisconsin. You can now watch Fudge and Cheese Curds being prepared through the new viewing windows. On the left is the fudge window, the right is the cheese room. Stop in around noon on Tuesdays and Thursdays to see these confections being made! Separate prep rooms for the cheese and fudge ensures the highest quality for you, the customer! Inside the Fudge room. Inside are 2 steam-jacketed kettles with stirrers to make the fudge creamy and smooth while cooking. It takes about 40 minutes for the fudge to be ready to pour and flavor. Read more on the fudge here. In the Cheese room, you can watch cheese curds mixed with herbs and spices to give you many flavor choices. You can watch both cheese and fudge being prepared on Tuesdays and Thursdays at around 12:00 PM. The new viewing windows to the cheese and fudge kitchen are a hit with the kids too! These new kitchens ensure that your cheese and fudge are prepared with the utmost care and in a very clean environment. You can see how clean everything is! Enjoy a tour of the store with me in the video below. You can taste all the cheese before you buy too. You can get pre-assembled gift boxes or choose your own selections for a custom box. Watch Megan make many varieties of delicious fudge right from the viewing window! Also, see April mix many flavors of delicious cheese curds made that very morning! I’m getting hungry just watching. You can also get sandwiches here, no need to go somewhere else for lunch or supper. Igor’s Big Belly Deli can make prepare sandwiches to order to go or eat there in their dining room. Get 8-inch subs too, pre-made and ready to eat. Menu here. We hope you enjoyed touring the Mousehouse Cheesehaus. Tony, Heather, and crew are happy to serve you and bring you the best cheese and fudge in Wisconsin! Contact them here or come for a visit! Mackinac Island is located in the Straits of Mackinac, between Lakes Michigan and Huron. The size is small, only 3.8 square miles. Don’t let the size fool you, it played an important part in the War of 1812 and Americans lost their lives defending it. In present times it is a great vacation spot that remembers its past. The name in Ojibwe means “Big Turtle”. About 500 residents live here year-round, almost everyone you see during the busy summer season is a visitor from somewhere else. Many workers here at the many businesses are also just there for the summer. It was not my first time here, it was Al’s though. My family took a trip here with my grandparents in 1971. Since we could not all go, I recreated the picture later. It was great to be back 45 years later! Two things Mackinac are best known for are fudge and it’s abundant lilacs. Island visitors are in fact nicknamed “fudgies” by the locals. The island has a 10 day Lilac Festival every June to celebrate the abundant flower. We were lucky to see some left even in late June. No motor vehicles are allowed here(except a few emergency). Horse-drawn wagons, bicycle and walking are how you get around here. Be prepared for many hills, some steep. The flattest route is around the perimeter of the island. If you have your own bicycle, bring it. It will save you money if it will be your prime mode of transportation. No worries if you don’t have a bike, there is a great selection at Mackinac Cycle across from the Arnold ferry dock. If your time on the island is short or you just want to take it slow, take the Mackinac Island Carriage Tour. It takes almost 2 hours, and is narrated. The kiosk is across the street from here. Here is the route. The stops are short, you get about 7 minutes at Arch Rock so have your camera ready! You can even ride a Taxi, but you have to arrange the ride in advance here through the dispatch. You can’t “hail” a taxi like you can on the mainland. Cash only. Here I am in Marquette Park, then and now. It was fun! Never thought I would get this chance to re-create this silly picture. Let’s explore Marquette Park, as long as we are here. Pick up island info at the visitors center across the street. In the park there is a statue of Father Jacques Marquette. On it are 3 plaques. The statue was erected in 1909. Before this was a park, it was a large vegetable garden. See about most historical island features here. Behind and above the park is Fort Mackinac, we hope to visit it next time. A beautiful day to soak up the sun amidst the lilacs! Be a part of the action! Take a cruise on Sail Mackinac! If you have sailing knowledge, they encourage you to assist the crew if you desire to. Also in the park is a Missionary Bark Chapel replica, an early small church on the island. You can go inside and see this diorama. From here you can see the McGulpin House, one the oldest house on the island, built around 1780. The house is on the corner of Market and Fort Street. Across the street from the park is Mackinac Island State Harbor. Quite the view! You can see the Arnold Transit Co. dock and Round Island in the background. On the left of this view is a Statue of Liberty replica. It was recently restored. The harbor looks especially beautiful at night, view is from Arnold ferry boat dock. Above Marquette Park is the East Bluff, with a great view of the harbor below. We went up there early Wednesday morning. The early ferries were bring supplies to the island before the first passengers. 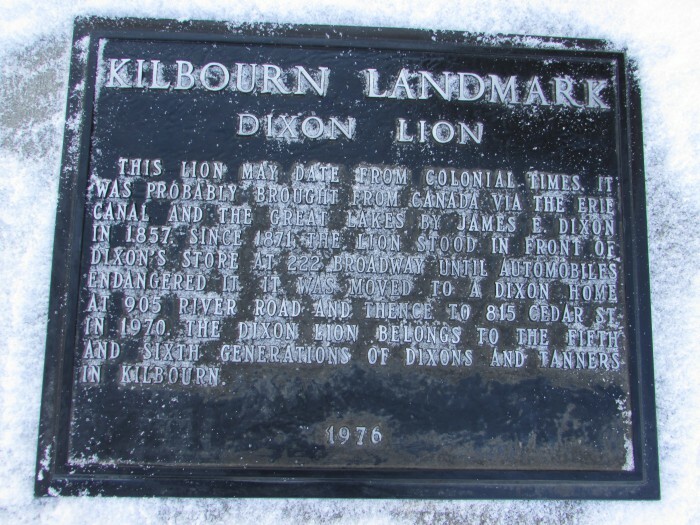 You could also find a couple historical markers up here on the other end of the road by the bluff. The first one is for Lewis Cass who distinguished himself with great service to this country. He also was Governor of Michigan Territory. Cassville, Wisconsin was named after him. Also up here is Anne’s Tablet, a local author who loved the island. The view is wonderful, especially in the morning when the island is waking up. And this is the former Indian Dormitory building, now the Mackinac Art Museum. Beautiful Main Street, where many hotels and great shopping (and fudge) can be found. 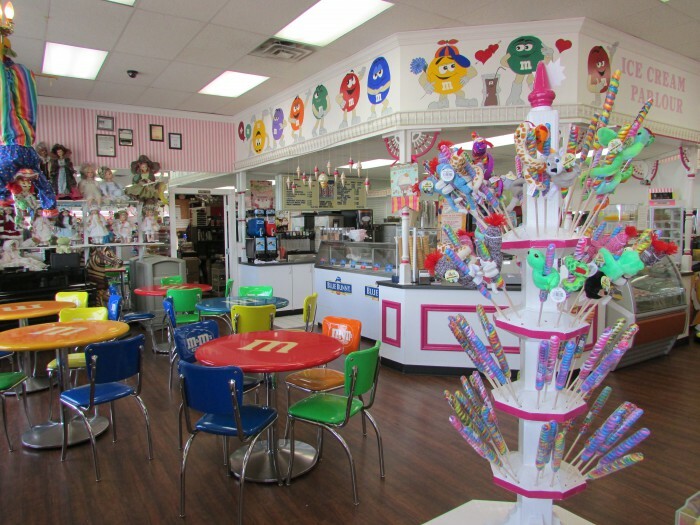 Speaking of fudge, let’s stop by May’s Candy Shop and see how the experts make it. They were the only shop open during the sugar-rationing days of WWII that made fudge. They made only one batch a day and sold only one pound per customer. They even have a trademarked quote, “Famous Mackinac Fudge”® Let’s watch them make a half-batch of peanut butter fudge! Many people say they can’t afford to spend the night on Mackinac Island, but that may be they are not keeping alert for price specials that happen often. The hotel Facebook pages are often where specials are posted. We chose to spend our night at the Murray Hotel, right across from the Arnold Ferry docks on Main Street. Their service is impeccable and hotel beautiful and in the heart of downtown. We were in room 318, a quiet interior room we would choose again. Check-in is officially at 3, but this room was available at 1:15 when we arrived! A porter was at our door with our luggage when we got there. We highly recommend the Murray! We also enjoyed their pizza buffet for dinner. Next to the Arnold dock is the Chippewa Hotel and Pink Pony Bar and Grill. It’s lights reflected on the water were real pretty that night. Their sister hotel is the Lilac Tree Suites and Spa. A beautiful hotel by day, the purple lights outside really set it off at night. 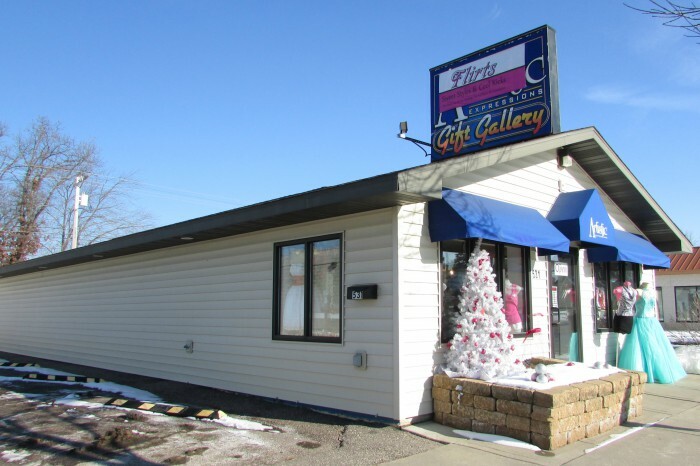 On the ground floor is the Little Luxuries gift shop. I found the perfect souvenier, this cute necklace created at Loveonthespot.com it captured my love for Mackinac Island so perfectly! The island has many interesting rock formations, we saw the best known ones. Arch Rock is a favorite! You can see another lookout above right see the lake. On the same side of the island is Dwightwood Springs. Don’t drink the water. Sugar Loaf Rock has a commanding presence above the landscape. Devil’s Kitchen is off the perimeter road on the island (I-85). Over 80% of Mackinac Island is a State Park , boundaries are clearly marked by signs. Neighboring Round Island Lighthouse lights the way for freighters and other boats to pass safely in the Straits. Once day a year, tours are given of the light house. A great view of the lighthouse is at Windmere Point, owned by the Windmere Hotel. The red object on the waterfront is a retired buoy from the Race to Mackinac from Chicago. This year is the 108th year of the race, beginning on July 23. See details here about the race, sponsored by the Chicago Yacht Club. It is the longest freshwater sailboat race in the country. We went to the waterfront at sunset to see the lighthouse, and a rainbow! And the whole scene, with Round Island in the middle of both light stations. The Mackinac Bridge gleamed like gold, what a beautiful evening that was. To learn more about the history on Mackinac Island, the Public Library is a great place to visit. We did some more important historic sites on the island. On Codette Ave. on the way to the Grand Hotel is the beautiful Little Stone Church. British Landing is where the British came ashore in 1812 to take possession of the island. A cannon is there facing the water and a historical marker. At this juncture is also a sign telling how far other landmarks are. You can grab a bite to eat at the Cannonball while you are here. From here we took a right to see the Battlefield, airport and cemeteries. A historic golf course is up the road from here. We also went by the cemeteries, airport and aforementioned Sugar Loaf Rock on this route. All this exploring works up an appetite! We enjoyed dinner at our hotel that first night. The next morning we had breakfast at the Pancake House, delicious pancakes and all the trimmings too! Lunch was at the Grand Hotel, quite an amazing meal with a great view! With only about 27 hours available, we couldn’t see everything, but we did our best! We hope to come back in 2017 to get to what we missed and see even more. Thanks for helping us make some great memories! our parting shot was people talking and laughing at the Pink Pony. It was time to board the Ottawa back to Mackinaw City at 5:00 to explore on Thursday. It was difficult to leave, we plan to come back. For a funny and informative video of Mackinac Island, enjoy this episode of Matt’s Rad Show on YouTube. It helped me in my research and made me laugh too. 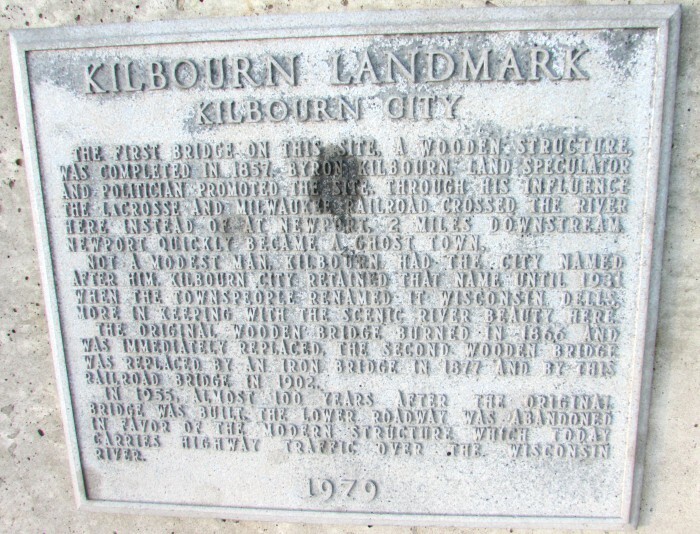 The Wisconsin Dells was founded as Kilbourn City in 1857. The name was changed in 1931. The Dells has been a vacation destination for over 150 years and you can see pictures and postcards of the early years here. 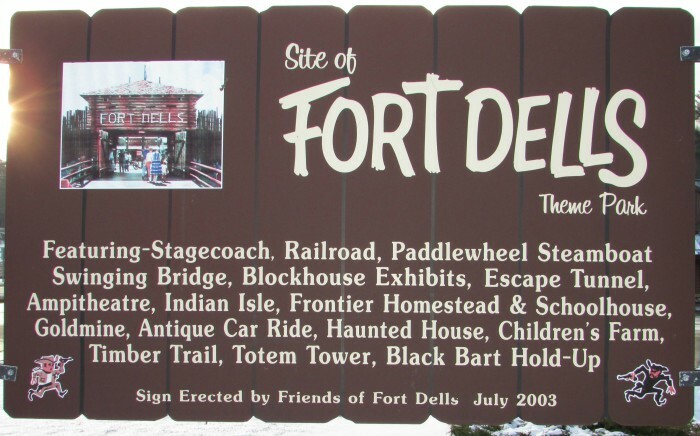 The site of one of the early theme parks called Fort Dells is marked by a sign, a Walgreens is there now. What you will see when you drive into the Dells along the Parkway and Broadway. 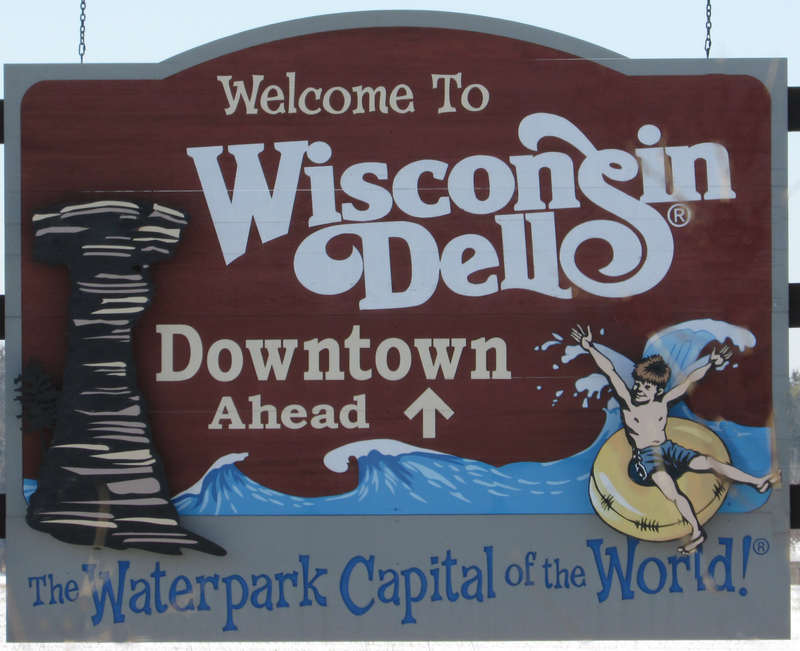 The population of the Dells is 2,678. 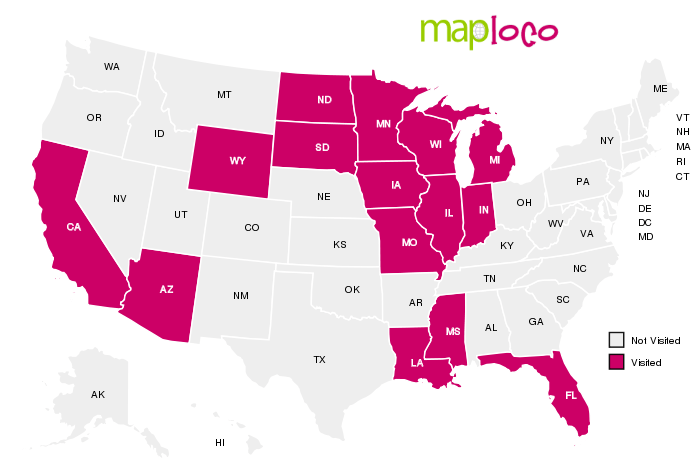 Even though it is known as “The Waterpark Capital of the World”™ now, it is so much more. 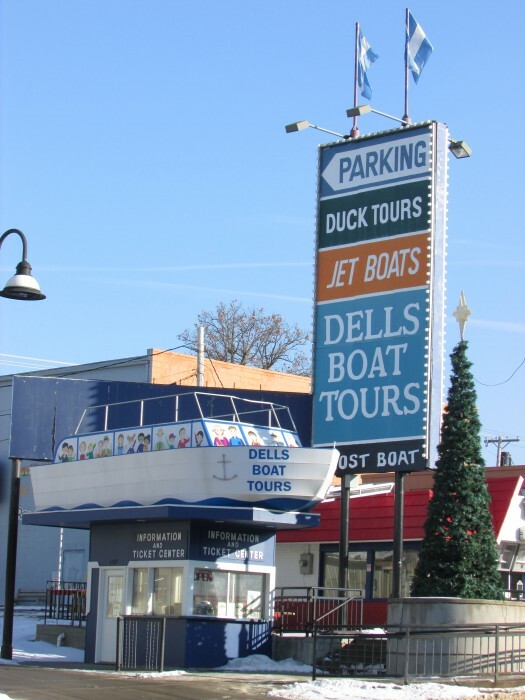 My own Dells experiences goes back to my childhood in the 1970’s and 80’s. Al’s family went to Jellystone Park, still going strong. 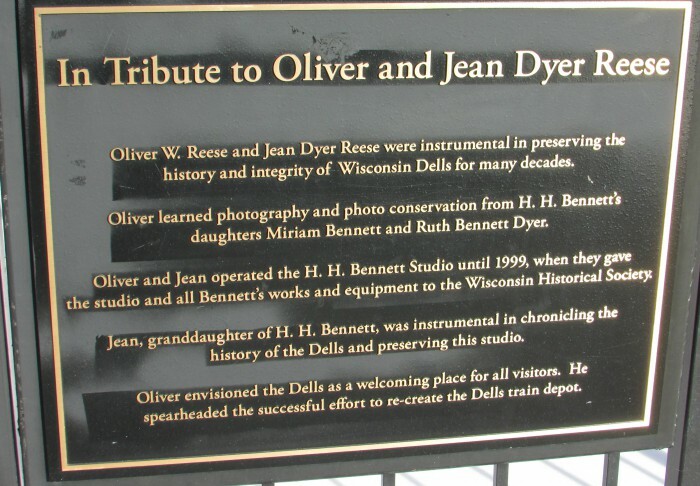 History is still an important part of the Dells and is the foundation for their continued relevance in the present and future. We are going to explore 7 blocks on what is called “The Strip”, or Broadway Rd. We start at the top of Broadway on the 100 block, just after we pass under the Amtrak (Empire Builder route) and Canadian Pacific train overpass. The CP train carries freight, but during the Christmas holidays they host a Holiday Train. On the left side attached to the concrete bridge support is this plaque. 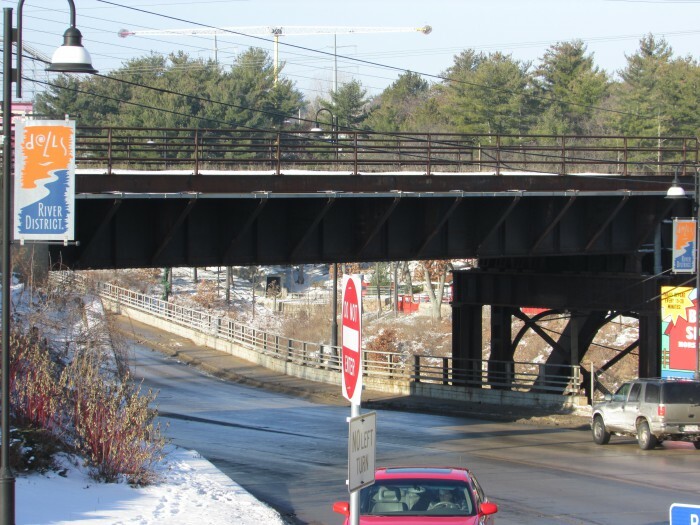 We had to carefully walk under the bridge when the road was clear of traffic to get a picture of it. We took a look at the charming depot. It was built in 1989 after the original was damaged beyond repair in 1982. It resembles many historic depots we have seen in other towns. Close to here, also a right turn off Broadway are two other historical markers and a very tall flagpole, the long driveway leading to them identified by a brown “historical marker” sign. 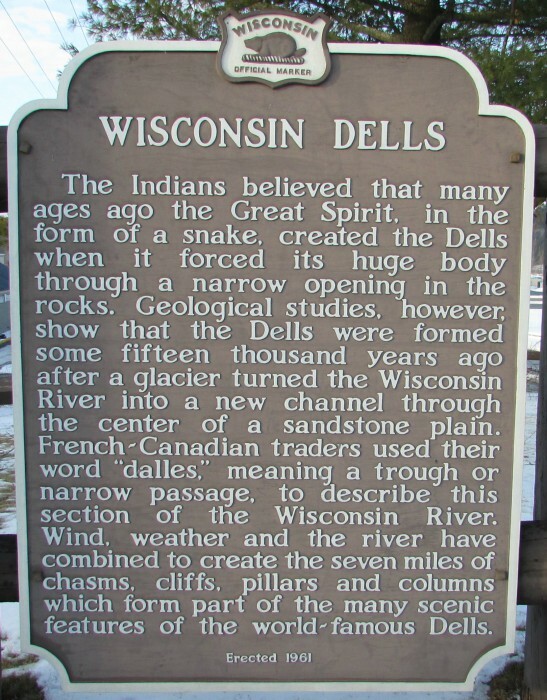 The first one is a history of the Wisconsin Dells. 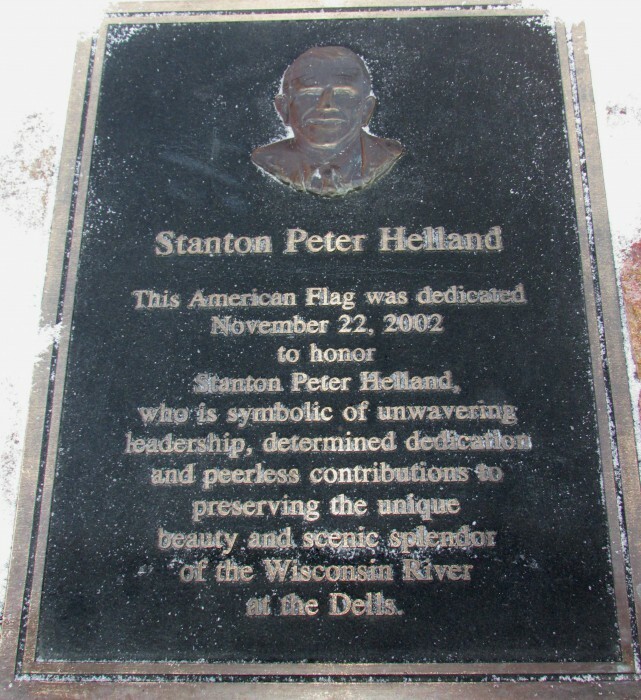 The other marker is on a large red rock in front of the flagpole, honoring Stanton Peter Helland. This is the view of the 100 block from halfway up the hill near the railroad track. Each block has many great businesses to appeal to both visitors. and residents alike. 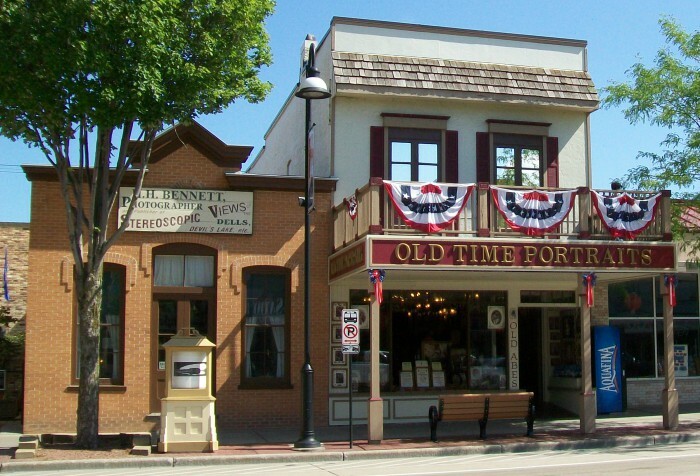 Downtown Dells has a website of its own since there is so much to do. Since we tend to be frugal travelers, the free parking downtown from October 15-May 15 appealed to us too. The drawback of winter, not all of the businesses/attractions are open. The first place on our right is the popular Showboat Saloon, styled to look like a river showboat. 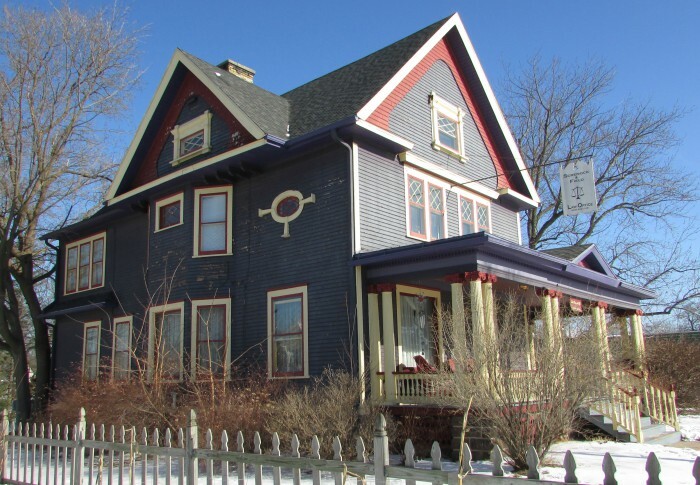 More than that, it is said that a ghost named Molly lives in this over 100-year old building in the upstairs apartment. The building owner no longer rents it out due to the ghostly disturbances. Other businesses on that side are Vintage Photos, Wisconsin Dells Fudge, Professor Porter’s Old Time Portraits and Haunted Mansion. 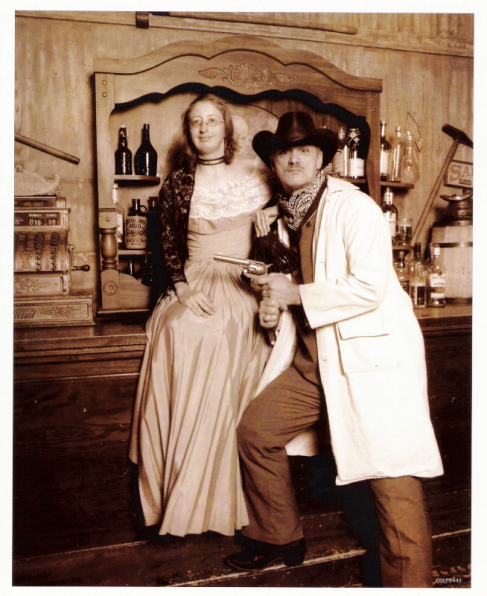 We had a saloon picture taken at Old Time Portraits in Nov. 2008. That was fun! Wizard Quest was on the other side of the street on this block. In the summer you can stop at this booth for all the boat tour information and tickets. There are several booths available on Broadway. 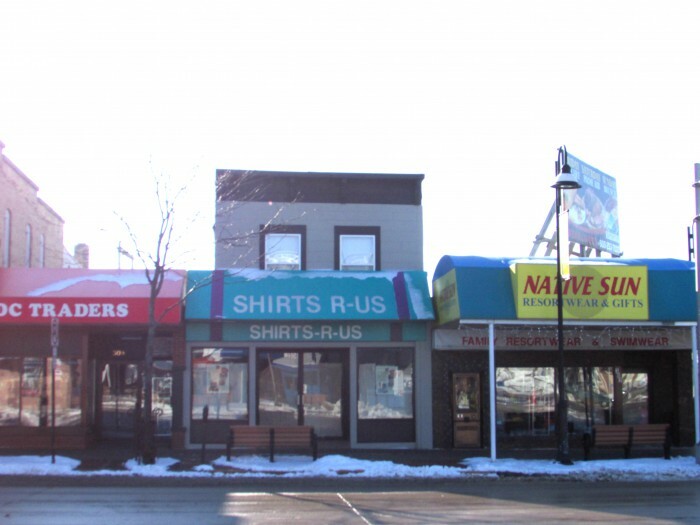 Next to it is Dairy Queen, Ripley’s Believe it Or Not, The Candy Connection, and Yuval Wear clothing. 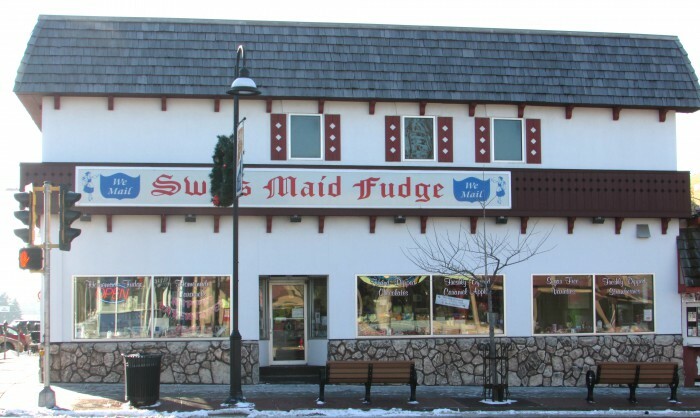 Across from here is Swiss Maid Fudge. This ends the 100 block. We cross River Rd. and the first place is Nig’s Bar, Souvenir City, Uptown Trading Post, the H.H. 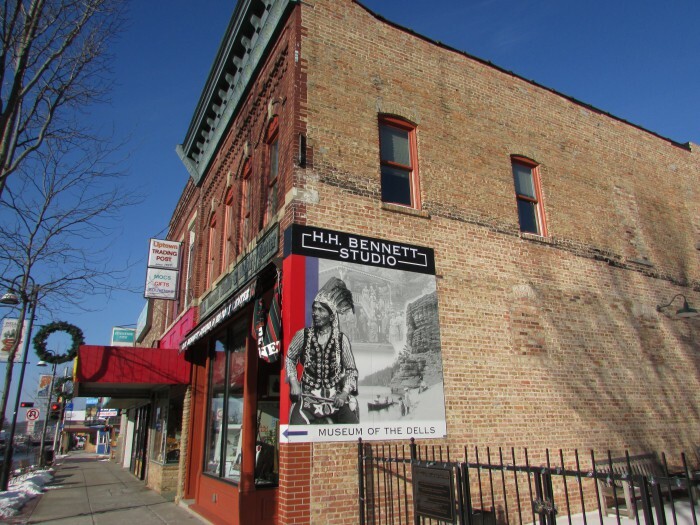 Bennett Studio and History Center, and Old Abe’s Old Time Portraits. Coincidentally, our visit on January 15 also happened to be H.H. Bennett’s birthday too! We visited the studio on June 14, 2015 to celebrate the 150th Anniversary. 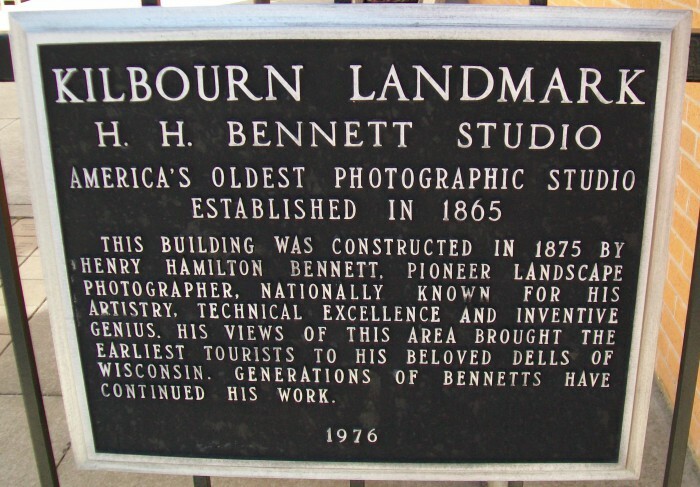 The Bennett studio is the actual one he worked out of, and we saw two historical plaques on the courtyard gate. Rounding out the block on this side is Cheese Cake Heaven®, open seasonally. From this side we look across the street to a wide variety of businesses, both old and new. At the right end is T-Shirt Factory. 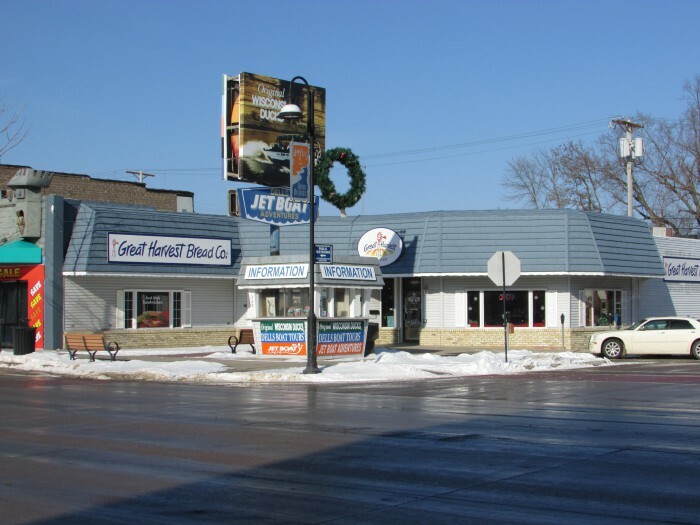 Right next to it is the new Dells Distillery (2013), then MACS-Macaroni and Cheese Shop for great meal choices. We had lunch at the Distillery on 6-14-15. Great food here. Buy clothes at Alpha Beta Karma next to Macs. Left of this store is another clothing store called Too Cute. Next in line is Wisconsin Dairyland Fudge, here since 1962. Next is Scent-Sations. More great food at Monk’s Bar and Grill, serving the Dells since 1947. In the tan building next to Monk’s is Xpressit. Then the popular Winnebago Gift Shop, where you can get moccasins and other apparel made by Winnebago (Ho-Chunk) Indians. 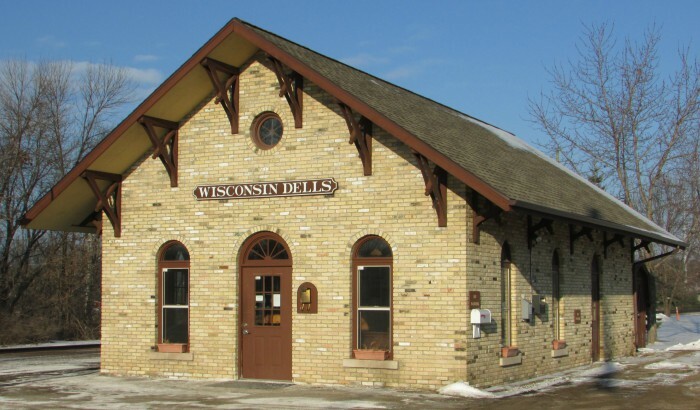 They have served the Dells since 1949 in a historic 1860 building. Finishing up this block is the Dells Fudge Company, Animaland for toys and games. Last is the High Rock Cafe. This block is the most dense for businesses on this historic street. We cross Oak Street to see what’s here, still plenty of places to see. This is the left side, beginning with Wally World Arcade, a popular place since opening in 1998. It houses the Dells only antique carousel. 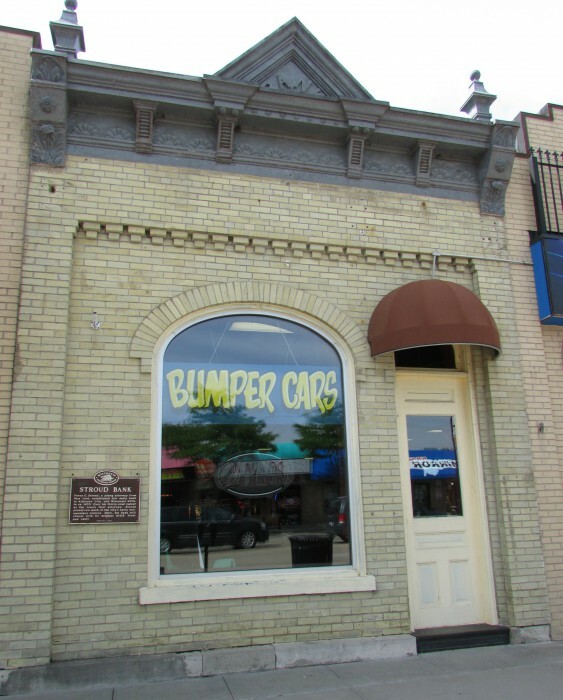 Next is Elements Skateboard Shop, then the Dells Discount Outlet. Rounding out this side is Book World, Wisconsin Dells Realty, Subway, Paintball Target Shooting and Best Bargain. A new Great Harvest Bread Co. recently opened here on the end cap of this row. On the right side we have Native Sun Resortwear and Gifts, Shirts R-Us (closed) and KDC Traders. 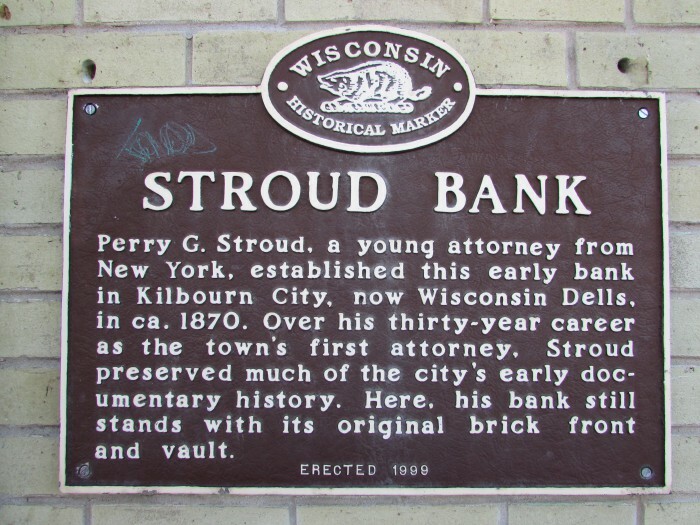 On the left is the historic Stroud Bank, now The Wild Fun Zone. 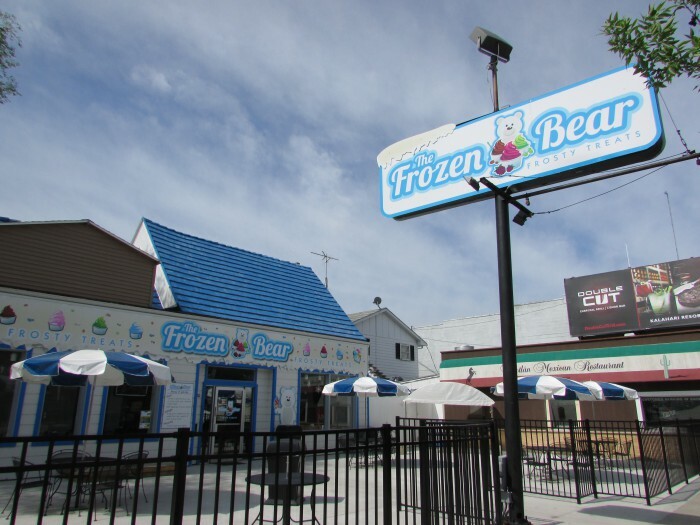 This block concludes with Colotlán Mexican Restaurant and The Frozen Bear Frosty Treats. We are now at the halfway point of exploring this fascinating street in downtown Dells. But wait, there’s more! After crossing Elm St., continuing on the left side is the Goody Goody Gumdrop store. next is Unique, a t-shirt store. A Dells Visitor Center is next to Unique. This side of the block concludes with Eagle Wings Sportswear, Dells Mining Company and Famous Dave’s BBQ. The right side is even more interesting. 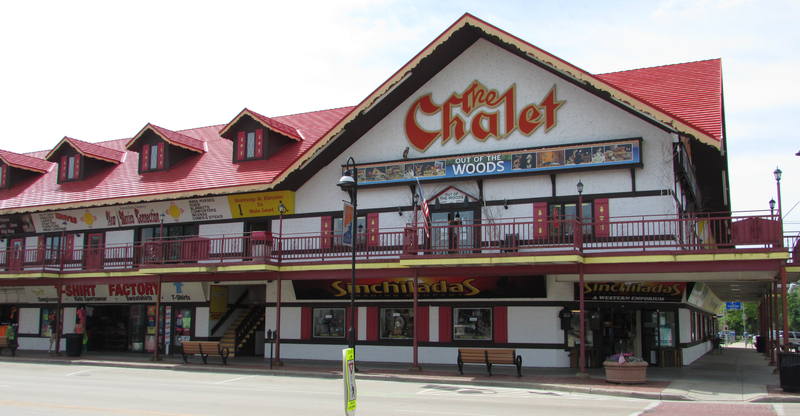 We begin with Chalet Lanes and Lounge and the Bavarian Village with German Glockenspiel. Let’s watch it tell the Pied Piper story! It was so interesting inside, so much candy and treats! At this point we are heading out of the heaviest shopping and attractions part of the street. There are still some places yet to see though. On the last long shopping strip on the left side are several shops. 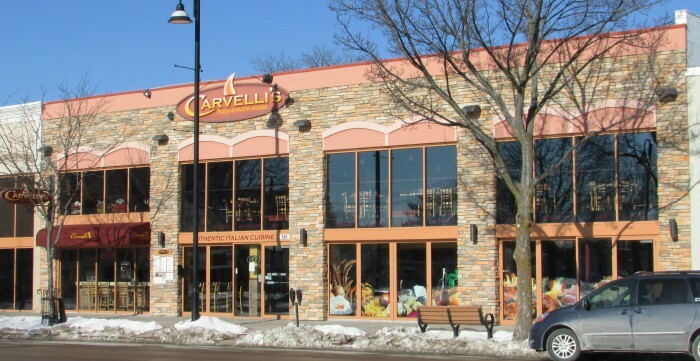 The first is a BMO Harris Bank on the left corner, then an Italian restaurant called Carvelli Pizza and Pasta House. Next is Affordable Leather and More, Cutting Edge Fitness, Paint It! Pottery Shop and Clothing Company for women’s clothes. The last business on this side of the street is a women’s boutique called Flirts. On the right side is Fitzgerald’s Motel. On the right side of this block is the Colonial Motel. This house on the left is Screnock & Field Law Office. 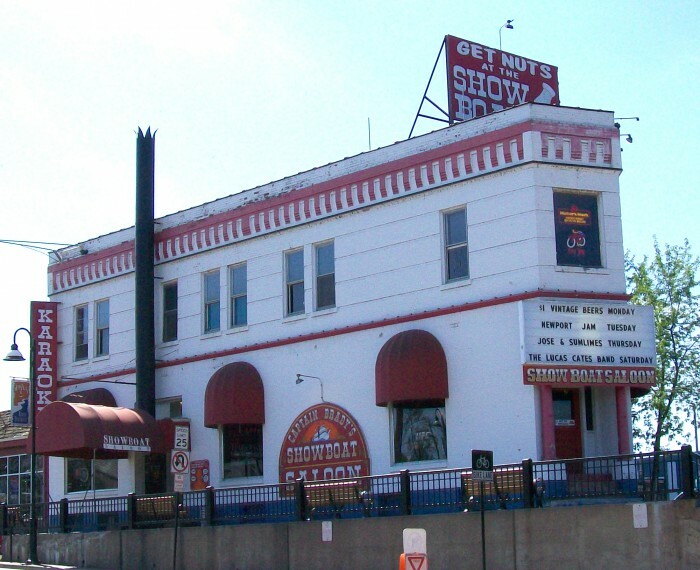 On our left is the Roadhouse Saloon. And the Starlite Motel. We reach another historic site on this block in Bowman Park. This is the Dells Country Historical Museum. 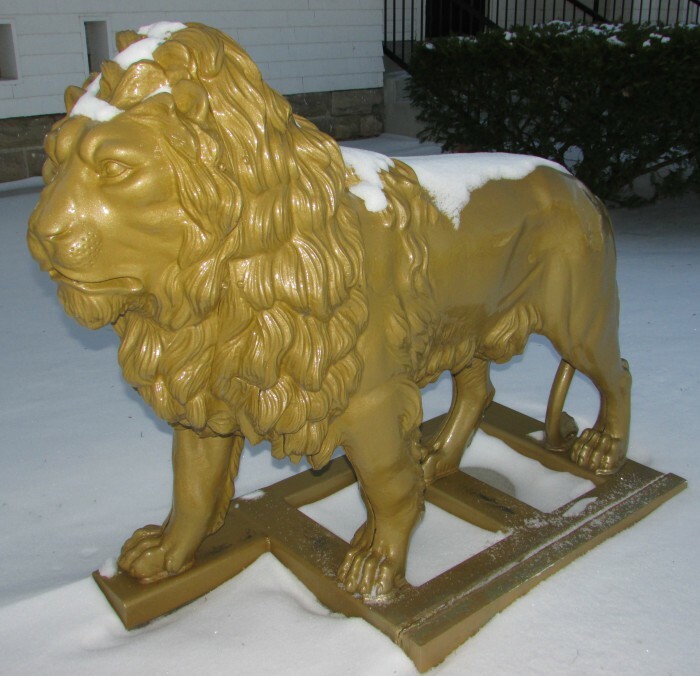 The yellow metal lion in front of the Bowman House is itself historical and has a plaque. it is possibly over 200 years old. It was a nice day to explore this famous street in the Dells and see all it has to offer. We will be back soon!